In the Welsh National League, Mavericks kick-started their title defence with two crushing victories at the season-opening weekend to sit top of the table! Their first opponents came in the form of Welsh League debutants, Swansea University, who showed resilience in what was a tough blooding for them in the National League ,with a team containing many new signings. Swansea were missing some key players in Wales international Emma Carswell and talismanic sharp-shooting Kanny Smith whilst Mavericks fielded a strong side featuring experience and up and coming talent. There were a number of debuts for Cardiff City & Met with Joshua Davies completing his transfer from Aberystywth Red Kites and Amber Rogers from Bristol University. Nick Butler appeared in his first league match following his debut at the Welsh Cup, and Zoe Clayton made her club debut. The game started slowly as both sides shook off the summer cobwebs, but Mavericks gradually started to build a lead with goals from Captain Stephen Campbell and Naomi Wrigley, who were both on fine form. Nick Butler took command in defence turning over the ball relentlessly and racking up an impressive tally of goals and assists, along with Alec Care who put his experience to good use in the other division. 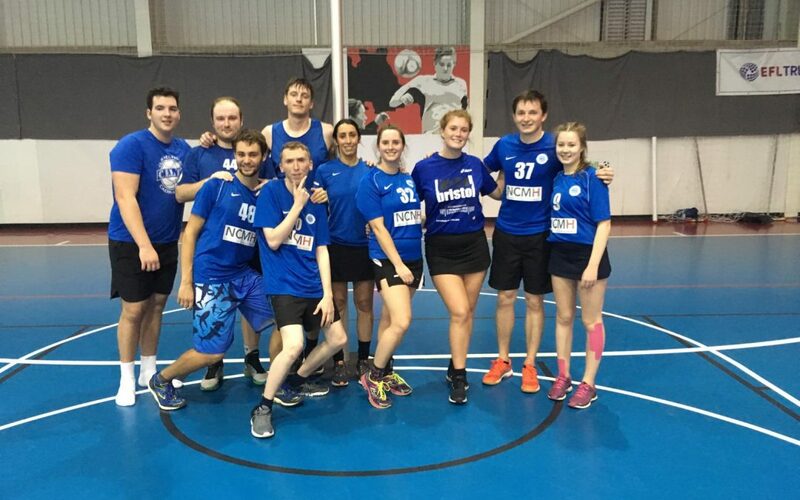 Amber made a good start to her time in blue and proved invaluable in all aspects of the match, proving that Bristol University is capable of developing fantastic korfballers. Jess Hall led a strong girl-focussed attack and created a myriad of opportunities for her side, whilst Zoe Clayton showed us that making your debut is no barrier to scoring as she sank 4 goals! Josh Davies was perhaps the unluckiest Cardiff player as his shots refused to stay in the basket, but he made up for his misfortune with 4 superb assists. From the bench came Cardiff Met prodigy Jai-V Mistry, named Most Valuable Player last season, he entered the game with gusto to earn an MVP performance, scoring two and assisting four goals in the process. Carys Weaver joined him, fresh off the back of her performance at the World Cup for Wales u19s, and added a further tally of goals and assists. The scoreline doesn’t reflect the valiant spirits of the Swans, but in the end Mavericks proved to be too much to handle and ran out victors, 33-0. The next match up came in the form of a classic Cardiff derby, Raptors 2 vs Mavericks. Last year Mavericks had the edge, but with new signings and a fresh season the result was anyone’s guess. For this game, Mavericks added some experience to their squad by deploying Welsh international legend, Zoe Rose, and last year’s challenger for Welsh League top scorer, Jack Mitchell, supported by the return of Cardiff Met’s Wesyn Dafydd. Mitchell took the helm for Mavericks, and partnered the enigmatic Campbell in what proved to be a deadly combination as they racked up 6 goals and 7 assists between them. Raptors matched the pace at first, with Andrew May putting in a stellar performance following his switch from Cardiff University, to earn himself Raptors MVP. Tom Coleman debuted for Raptors after making the switch across town from City & Met, but had a tough first day at the office containing the Mitchell-Campbell duo. Zoe Rose made her league return, after a break from the court, and proved her worth with her assisting, coupled with Naomi’s continued form to bag three goals, the girls ensured they all got onto the scoresheet again in this match to stretch the scoreline out of Raptors’ grasp. Wes made sure her bagged himself a goal with his trademark North Walian style. A flurry of goals towards the end, including Josh Davies’ first for Cardiff and capped off by Zoe Rose, put paid to any hopes of Raptors salvaging a bonus point from this encounter. Nick put in another impressive performance but was pipped to MVP by Captain Mitchell, and Naomi finished the day as top scoring Maverick, closely followed by Stephen who racked up the most assists.